These are the best quality and inlcude a notepad. Very Pleased! Nice size squares with enough room for notes. I also like the fact that it is 2 years. My husband and I are of an age where we go to see doctors almost every 3 months. With this calendar I can make the next appointment and then come home and put it on the large calendar. I can also schedule while I am right there at the doctor's office without having to come home and call them back. We have a large family - need to keep up with birthday and anniversary dates. Very handy to carry this in my purse and pick up cards on the spot. Would be lost without it!! I"m very satisfied with everything, so far. Have been using these for years. Miles Kimball has the best prices. Excellent! I need a pocketbook sized planner to take with me to my medical appointments. I can verify that I am available for the next appointment and transfer the information to the large family calendar when I get home. No more missed appointments! have lots of appointment and I like that it is easily accessible. Nice personalized cover. Great quality. Nice notepad in the back. My mom loves this - beautiful design and thoughtful construction. This made a Beautiful gift !!! 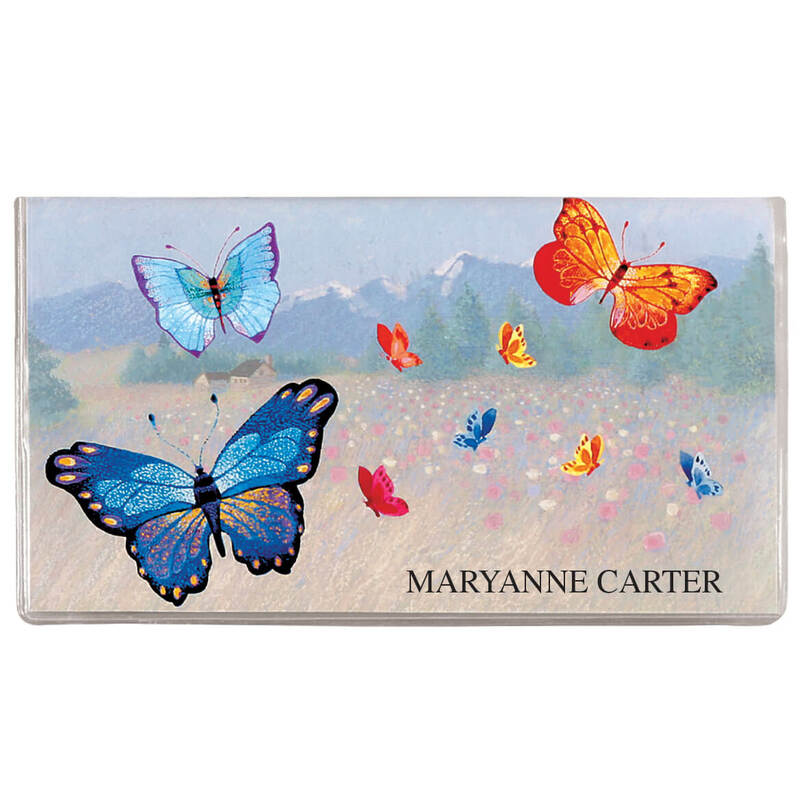 This makes for a great gift for my butterfly friend.And a great way to keep up with things. As helpful as it is pretty! I ordered this calendar last year and I use it just about every day. It is tremendously helpful in keeping track of everybody's work schedules, doctor appointments, etc. Besides that, it is very pretty and very well made. Mine has gotten lots of use and still looks new. Mine runs out at the end of 2016 and I will definitely be reordering. This makes a wonderful Christmas gift for your co workers. They even come up to me and tell me they want one for Christmas this year. We all love it. Beautiful, usable, and affordable. Given as a gift to help a new graduate start life as an organized person in the working world. I like the idea for personalization of the item. It is a gift for my sister. Month at a glance a great feature. Love the design and needed the 2 yr planner, just what I was looking for. Love how I could put my children and g-children letters on. I like to keep track of appointments. I was looking for something to personalize for Christmas gifts and this was an ideal choice even though the themes are not Christmas related. Everyone needs to keep up with their daily plans and appointmments. I just like the way they look. Two year calendars are hard to find. Just needed a new 2 year calendar. This is something I need to have with me when I am away from home. This way I can carry my appts. with me. And the Butterflies are beautiful! I love their 2 year planners. I also love Butterfly's so that is why I picked this one. Because my sister loves Butterflies. Clear interior space for appointments and notes. Needed 2 year pocket calendar to replace current one. These items were ordered for gifts and both recipients love butterflies! Liked design, can't live without it. Like that it is 2yrs. and has a note pad. I have purchased these previously. They are easy to use, stay clean, and remain in good condition for the 2 year lifespan. They help keep my life organized--good job! Because my best friend LOVES BUTTERFLIES! Item is convenient to track appointments, events, birthdays, etc. on a daily or monthly glance. My friend that took care of me at Mayo Clinic loves butterflies. I chose this for a friend who likes butterflies. Use these planners all the time and love butterflies. because it could be personalized. and also the price. Nice to carry in my purse. I had one before, it held up well and it covers 2 years. Helps me to remember important dates and appointments. by "writing" it down on a small calendar. Also, it's 2 years and personalized! Buy new planners all the time from Miles Kimball. Need one for next 2 years. Love the personalization idea. As gifts for folks who worked for me. Are the two-year pocket calendars for 2017 & 2018? BEST ANSWER: I would assume so because my last planner was for 2015/2016. I love this planner which has lots of space for notes and a good sized box for each day. I'm collecting orders from friends to order again. THE ONES I ORIGINALLY BOUGHT WERE FOR 2015 AND 2016. THE NEWER ONES I JUST GOT ARE FOR 2017 AND 2018! HOPE THIS ANSWER HELPS YOU! The butterfly I bought in 2014 was for 2015 and 2016. I recently bought a new one and it is for 2017 and 2018. Thank you for your question. Yes they are. We hope this information will be of help to you. Yes it is for 2017 & 2018 have a happy new years! 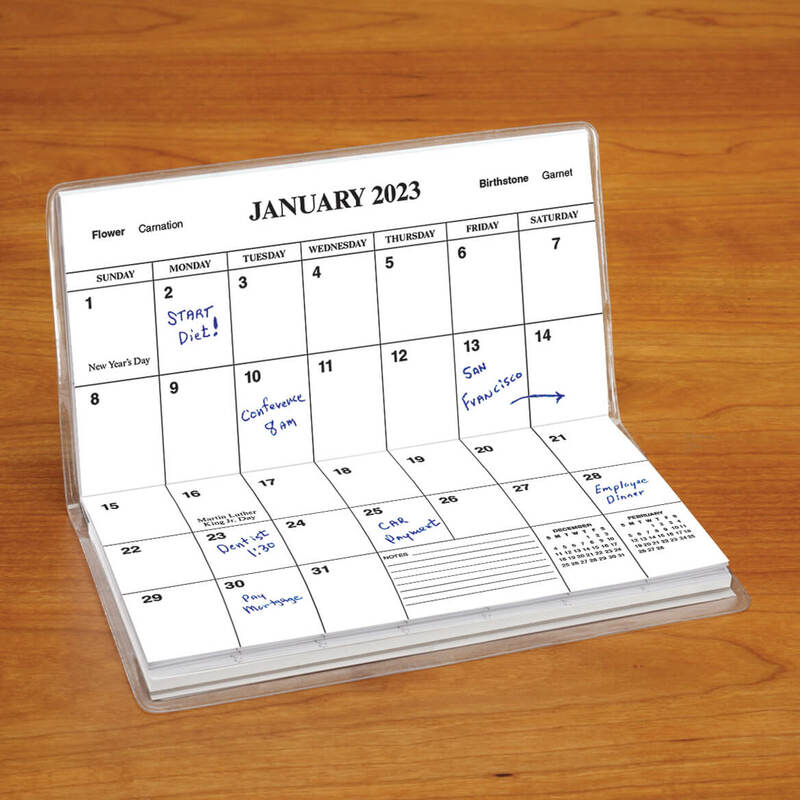 CAN I BUY THE REFILL INSERTS OF THE PLAIN PAPER FOR THIS CALENDAR? BEST ANSWER: Thank you for your question. We do sell the refills for the notepad. We hope this information will be of help to you. is the calendar 2015 and 2016? reorder two every two years. These calendars are for 2 years with a pad for notes in the back. I can keep track of Doctor appointments way in advance especially when they request you come back in 6 months and it is currently Sept. I would recommended the Pocket Planner to anyone. Thank you for your question. Yes, this item is currently being offered for years 2015-2016. We hope this information will be of help to you. The lettering on the personalization was very nice print. The calendar boxes are large enough to write your schedules in. I would presume yes as miine was 2014-15. I really like it! is this 2017 and 2018? BEST ANSWER: Thank you for your question. These are for 2017-18. The image will be updated shortly. We hope this information will be of help to you. The one I purchased in late 2017 was for 2018-2019. Is the Two year pocket calendar for 2019 - 2020? BEST ANSWER: Thank you for your question. The two year planner is 2019 - 2020. We hope this information will be of help to you.